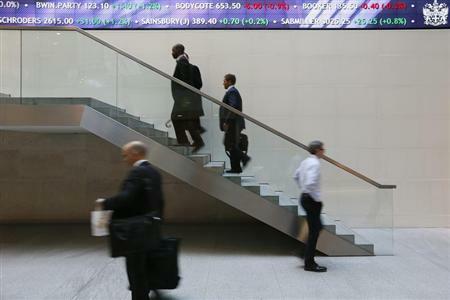 SYDNEY (Reuters) - Asian shares could get a welcome reprieve from selling on Wednesday as Wall Street steadied and investors in emerging markets found some backbone, tempering safe-haven bonds and the yen. 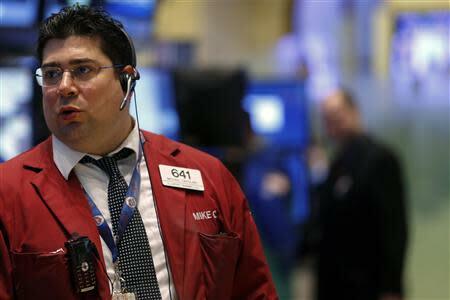 Still, dealers cautioned that the mood remained brittle and it would only take a poor U.S. payrolls report on Friday to set the bears running again. For now, the Nikkei <.N225> looked set for a rebound after a couple of days of punishing selling, with futures pointing to an opening gain of around 2 percent. However, it will face stiff resistance at the 200 day moving average at 14,425, while there is a large gap to fill between Monday's close and Tuesday's opening. The index has shed 14 percent since the start of the year following last year's 50 percent boom. Early Wednesday, MSCI's broadest index of Asia-Pacific shares outside Japan <.MIAPJ0000PUS> inched up 0.13 percent, while the Australian market added 0.2 percent <.AXJO>. On Wall Street, the Dow <.DJI> ended up 0.47 percent, while the S&P 500 <.SPX> added 0.76 percent and the Nasdaq <.IXIC> 0.86 percent. The bounce helped pull MSCI's world index <.MIWD00000PUS> from its lowest level since October. Europe's top shares <.FTEU3> pared early losses to end 0.17 percent lower. The modest improvement in risk appetites led to a pullback in the yen and Swiss franc, and a generally firmer U.S. dollar. 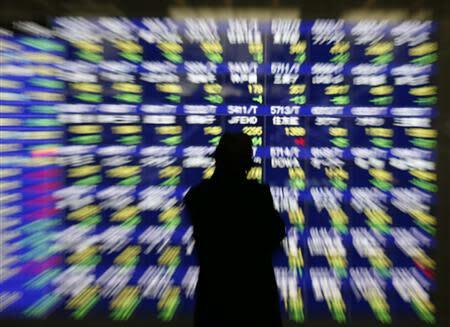 The greenback edged up to 101.64 yen, having found solid support at its 100.75 trough. The euro eased a touch to $1.3510, still dogged by speculation that the threat of deflation might nudge the European Central Bank into easing policy at its meeting on Thursday. The major mover in currencies was the Australian dollar which surged after the country's central bank on Tuesday shut the door on further rate cuts, citing a pickup in housing and consumption and higher than expected inflation. The Aussie was enjoying the view at $1.8920 after climbing a steep 2 percent overnight. It also rallied sharply on the euro and yen as speculators were forced to cut short positions in what had been a very crowded trade. The New Zealand dollar got its own boost when jobs data showed strong employment growth for the fourth quarter of last year, adding to the already considerable case for a hike in interest rates. 1 percent, the biggest one-day gain in nearly a month. U.S. oil futures rose on bets on a reduced stockpile at a key delivery point due to the start-up of a major pipeline. The March NYMEX contract added 55 cents to $97.74 a barrel, while Brent crude eased 4 cents to $106.00.